Standard - £40.99 Only 9 left! What makes a knight truly evil? Well, there are a lot of things he can do. An evil knight doesn’t rescue fair maidens from vile dragons. Instead he rescues vile maidens from fair dragons. It’s a lot easier to do, and a lot more rewarding too, if you catch our drift. When an evil knight goes to the local tavern, he never tips the ale wench more than 10%. And do you know those people who take steaks from the meat department and leave them in unrefrigerated areas at the grocery store? They’re evil knights, all of them. We know so.
. Also, evil knights never wear white before labor day. We personally think that last part is going to far, but we don’t want to say anything because we’re thoroughly happy not being impaled by six foot long claymores. If you’re looking for a totally metal costume, something that really says “none shall pass,” then you’ve come to the right place. 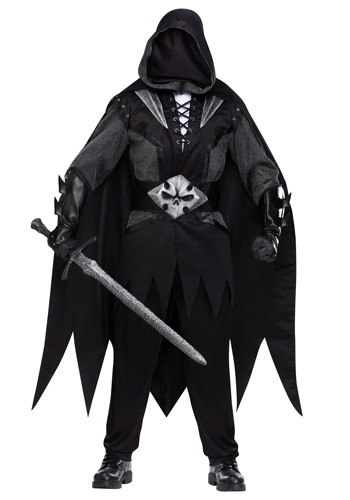 Our Evil Knight Costume has the tunic, gloves, cape, and belt you need to let do-gooders know their days are numbered. So pledge your allegiance to a dark wizard, a netherworld demon, or just your plain old nasty self and get out there and start terrorizing the land!